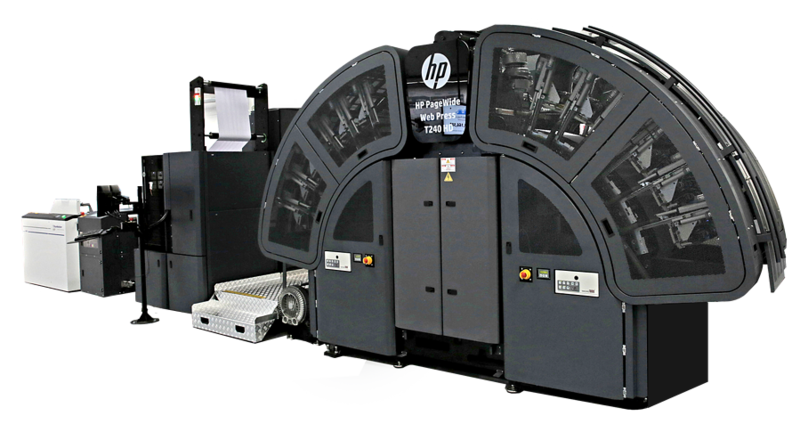 Expand your printing horizons and reinvent your mailing goals with the innovative, state-of-the-art HP Graphic Arts Press. This press produces outstanding print quality and unprecedented versatility that’s both easy to use and seamlessly meets your workflow needs. HP High Definition Nozzle Architecture (HDNA) completely raises the bar in digital color quality, using 2400 nozzles per inch native resolution and dual drop weight to deliver image detail like never before. The result: image quality ideal for demanding applications in publishing, direct mail, and commercial print. 1 Performance mode delivers high quality using single (or high) drop weights. 2 Quality mode delivers the highest quality using dual—low and high—drop weights. 4 Requires CM779# Unwind Module and CM825# Duplex Rewind Module. 5 Basic press configuration supports 40-215 gsm. Media between 40-60 gsm require pre-sale testing per application. 6 Dimensions for standard configuration with optional unwinder and rewinder. 7 Optimal operating environment may vary by application. 8 Estimates are for the base press only on uncoated media with typical 5 to 10% black ink coverage and 25 to 30% color ink coverage.